He came home and passed out - puppy happiness! aw so cute! i remember puppy socialization with my doggie. 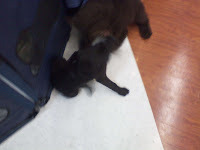 the dogs were so scared of each other!